"Men's Navajo Tiger Eye, Picture Jasper and Jet Ring"
"Men�s White Buffalo Stone, Corn and Kokopelli Ring - made to order"
Zuni Graphic Inlay Ring by Cen. 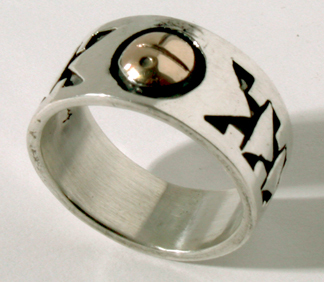 Zuni Graphic Inlay Ring by Q.L.B. 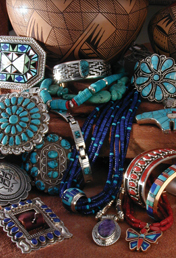 Zuni Pendant Cabochon Ring by E.P. Men�s Silver Wolf Pack Ring by R.B. """Wedding Ring Inlaid with Lapis, Turquoise and Opal"""